Magdalene survivors, symphysiotomy campaigns and UNCAT criticism of abortion guidelines…this is the year that was. 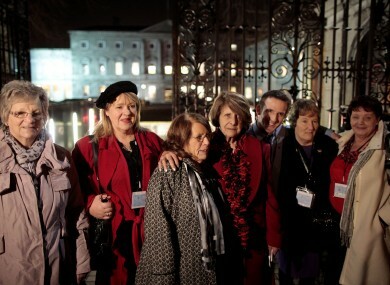 Marina Gambold, Maureen Sullivan, Mary McGuinness, Kathleen Janette, Steven O'Riordan, Geraldine Cronin and Julie McClure of Magdalene Survivors Together leaving Leinster House in Dublin after hearing Taoiseach Enda Kenny's state apology in Februrary. ‘WOMEN’S ISSUES’ IS not at term that should be used often. At best, it is largely inaccurate. At worst, well, it doesn’t really mean anything. Ireland has been dealing with a number of ‘human rights’ issues over the past 12 months, just many of them happen to have women at their centre. But that does not mean that those matters only impact female citizens. Ireland does not have a great track record in terms of rights for women, children and other vulnerable residents. And during the past 12 months, it has admitted that in various ways. The country has gone about – in an unprecedented way – to set some of those wrongs right. It hasn’t always succeeded. There have been slip ups. But even the fact that we were talking about the Magdalene Laundries, symphysiotomies, Michael Neary’s victims, domestic violence and maternity care during 2013 highlighted the efforts being made. Unfortunately for survivor groups, support organisations and victims, economic woes, government u-turns and a lack of across-the-board political will have often meant we fell at the last hurdle. On 19 February, Enda Kenny found it difficult to keep his emotions in check as he issued a formal, State apology to those women who were denied their childhoods, rights to education and freedom at the Magdalene Laudries. The moment came after years of campaigning, painstaking research by academics and the mammoth McAleese Report which the Taoiseach said “shined a light on the dark history” of the infamous institutions. Although there were tears of joys and hugs among survivors who were sitting in the gallery of the Dáil that day, the apology did not bring the full closure required. There are still quibbles over the compensation to be paid out, as well as criticisms of the limitations of the report which confirmed there was State involvement in sending young girls into the system. At the end of last month, the UN Committee Against Torture (UNCAT) asked the State to provide information about the redress plans. It also called for a ‘prompt, independent and thorough’ investigation into the Magdalene Laundries and have asked the State to provide information on the work done to date to achieve this. Its submission to the Irish authorities discusses the McAleese Report into the Magdalene Laundries but notes that “the duration of stay was not recorded for 58 per cent of admissions to the Magdalene Laundries”. As we moved towards 2014, support groups called for the process of paying out the compensation to begin without further delay as a number of survivors have passed away without getting their full entitlement since the apology. In November, Minister Alan Shatter confirmed that payments would begin in December but there are still lingering problems. Yesterday, the Justice for Magdalenes group announced the sad passing of survivor Josie Fitzpatrick. “How many more will be denied ’til they die?” the groups asked. During the same meeting late this year, UNCAT also had questions about Ireland’s current guidelines for doctors on “criteria to be met for legal termination of pregnancies”. It asked whether “adequate procedures exist to challenge differing medical opinions, and whether adequate services for carrying out abortions exist in the State party”? The queries come after the Oireachtas spent a significant amount of sitting time talking about the Protection of Life During Pregnancy Bill 2013. The country has been divided by the abortion issue – more specifically, the X Case – for almost 22 years, causing stress factors in the makeup of Irish society. Over the decades, a number of women’s rights groups had banded together to fight for an Act which would legislates for the X Case. Rightly or wrongly, some pro-choice groups saw the death of Savita Halappanavar as the catalyst for the government moving on putting the Supreme Court judgement on statutory footing. It was, however, pressure from the European Court of Human Rights which ruled in the ABC vs Ireland case that a woman’s rights had been violated because of unclear guidelines for dealing with medical terminations, which forced Enda Kenny’s hand. The legislation was passed in the Dáil on 12 July following a number of controversial overnight sessions. It will come into force in January 2014. Pro-Life groups were dismayed with the development, as were some others, including Terminations For Medical Reasons, but for different reasons. Only finding its feet in the media spotlight this year, the recently-founded group has a busy year ahead as it takes cases against Ireland to the United Nations. The men and women involved in TFMR have been touched by pregnancies where the foetus has been diagnosed with a fatal abnormality, with doctors often using the term ‘incompatible with life’. Families dealt the devastating news are also told by medical personnel that an early inducement or termination of the pregnancy in Ireland is not an option. Women must carry to term or travel abroad. The UNHRC has already urged the State to clarify its position on abortion in the case of a fatal foetal anomaly and to provide details of their plans to provide certainty and assistance to women in such situations. Although sympathetic to the organisation when it gathered at Leinster House to share its members’ heartbreaking experiences, politicians said their hands were tied. They claimed that if they provided for foetal abnormalities in the Bill, it could be deemed unconstitutional because of Article 40.3.3. This is not the only maternity care issue that has been raised in the Dáil multiple times this year. The symphysiotomy scandal actually broke in 2002 but more than a decade later, a sitting government was yet to provide the closure the victims demand…and deserve. Carried out in Irish hospitals long after they were discontinued in other jurisdictions, the childbirth procedure involved unhinging the woman’s pelvis and widening it by up to 3.5 cm. It was used as an alternative to Caesarian Sections as doctors and the Catholic hierarchy which ran the wards believed they would facilitate future births and avoid the need for family planning for medical reasons. Earlier in the year, the Fine Gael/Labour coalition had accepted a Private Members’ Bill which would lift the statute of limitations, allowing survivors to take legal action for medical negligence. Minister Reilly said he wanted to signal his “intent to do whatever is possible to bring closure” to the 200-or-so women. Despite the caveat that the proposed laws held serious flaws, the decision was hailed by the Survivors of Symphysiotomy group. But then came a long wait. And than an even bigger blow – a government change of heart. Similar to the Magdalenes, the survivors are mostly older women. Many are in ill-health or have difficulties travelling or just getting around. Chairperson of SOS, Marie O’Connor, believes 2014 will be a “big year” for the women as the first test cases will reach Irish courts, while others are taking the case to UNCAT. She has dismissed the suggestions of a redress scheme mooted by Minister for Health James Reilly. Describing the government’s u-turn on the statute of limitations as “appalling”, she told TheJournal.ie that victims want proper compensation for the horrific operation – which was often performed against their knowledge. “We want them to have unfettered access so they can take the speediest possible route,” she said, pointing out that the statute may not even be used by defendants in cases. We’ll have trial dates quite soon and we hope winning a small number of them will encourage the other side to settle – our view is that, one way or another, there is going to be a settlement so we’re saying the government should settle now rather than later and avoid those legal fees. The women who underwent the procedure have also rejected the proposal of a redress scheme similar to that of Magdalene survivors as they feel they should be treated as victims of medical negligence and have damages awarded accordingly. Buswells Hotel was the scene of multiple press briefings for the TFMR and SOS. It also hosted a number of patients who were treated by infamous obstetrician Michael Neary before he was struck off the medical register in 2003. About 35 women were excluded from a previous compensation programme because of restrictive age grounds and various other medical technicalities. The Lourdes Hospital scheme saw about 200 patients granted in excess of €20 million following Judge Maureen Harding Clark’s 2004 deliberations. Following years of campaigning and retelling their stories, victims were granted good news on 11 November when the fresh scheme was launched. Advocacy group, Patient Focus, said it was looking forward to seeing the matter “finally be confined to sad history”. It is a great pity that there are many more issues out there that have not yet been placed in that same dark hole of Ireland’s shameful and sad history. Email “Ireland, women and 2013: A year we dealt with our legacy issues?”. Feedback on “Ireland, women and 2013: A year we dealt with our legacy issues?”.